Most residents in the state will remember the challenges of being without electricity for up to 10 days in the aftermath of at least one of the major storms we’ve experienced in recent years. In response, Connecticut now leads the nation with its innovative microgrid program, which once again features UConn as a key player and potentially as a statewide center of excellence. Under its three phase, multi-year microgrid program, DEEP provides grant funding for high-tech switchgear, independent distribution systems and automated controls that enable on-site, efficient, and preferably clean, energy-generating sources to operate in “island mode,” separate from the utility-owned grid. Last year, UConn was in the initial group of nine, including municipalities, hospitals and other college campuses, to receive a phase one incentive grant. In our case, $2.14 million in funding will be used to convert our 400 kW ClearEdge fuel cell, a source of combined heat and power to most of the UConn-owned and occupied buildings at the Depot, along with a small PV solar array, into a clean energy microgrid. In turn, when this system is installed and operating this fall, it will ensure continuous power to certain facilities that can meet public needs during extended grid power outages, like electric vehicle charging stations, a communications command center for UConn police and fire departments, and community warming centers, with kitchens and restrooms. Installed in 2012, the fuel cell generates heat and power through an electrochemical reaction, similar to a battery, not through combustion. Our Depot Campus fuel cell reduces UConn’s carbon footprint by more than 800 tons a year compared to receiving power from the grid or using more conventional fuel-burning sources of energy. Thus, UConn’s microgrid not only makes for a more resilient and reliable energy infrastructure but also helps promote the use of cleaner, renewable, and more efficient energy sources. Beyond these immediate operational and public benefits, UConn’s microgrid will be another example of a state-of-the-art “living laboratory,” i.e., an on-campus platform for research and a functional demonstration project for education and outreach. Already, a half-dozen faculty members affiliated with the University’s Center for Clean Energy Engineering (C2E2), led by Dr. Peter Luh in Electrical & Computer Engineering, are preparing and envisioning research grant proposals on hot microgrid topics like energy storage, advanced optimization and ultra-fast programmable networks for virtual energy management. 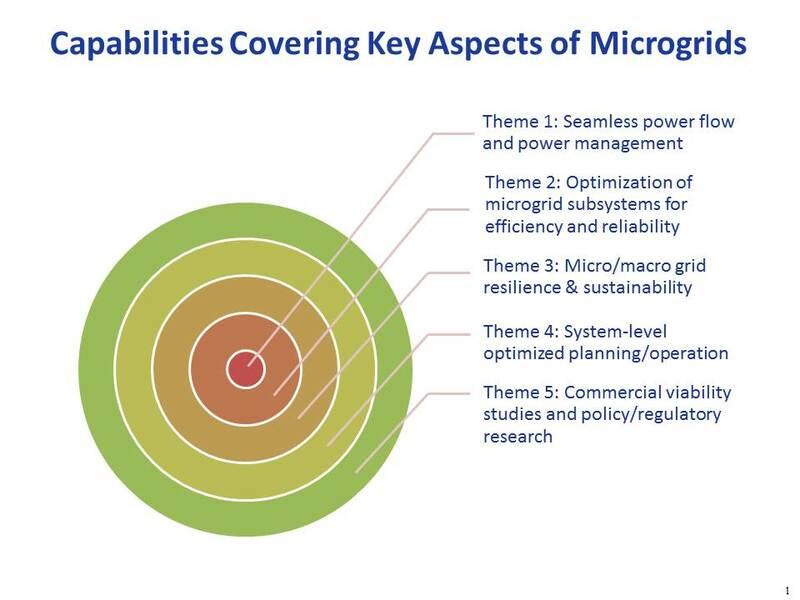 Plenty of good reasons for UConn to stay at the forefront of microgrid research! 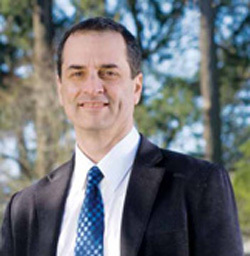 Dr. Mark Boyer, a Political Science professor who focuses on environmental politics and is the director of UConn‘s new Environmental Studies B.A. degree program, is looking at the drivers and barriers to local governance of climate change. In particular, he’s studied climate adaptation policies, ordinances and other initiatives adopted by Connecticut towns. Dr. Manos Anagnostou (Environmental Engineering/ENVE), Dr. Brian Hartman (Math), Dr. Marina Astitha (ENVE) and PhD candidate Dave Wanik (ENVE) are working on weather-based damage prediction models for the electric distribution system in CT and MA. The models relate high resolution weather forecasts, distribution infrastructure and GIS data to historic damage observations, and will soon include tree trimming data as a model input. Also, led by Dr. Jim Edson (Marine Sciences), nearly two dozen faculty members in UConn’s inter-disciplinary Atmospheric Sciences Group, along with affiliated graduate Research Assistants, met last month to discuss their climate change-related research. Many are studying the impacts of climate change on everything from terrestrial biota, to coastlines, estuaries and oceans. Much of this research is intended to provide data that will guide the development of mitigation and adaptation strategies, pursuant to the mission of UConn’s new Institute for Community Resiliency and Climate Adaptation. You can learn more about this research by attending UConn’s third annual Climate Impact Mitigation & Adaptation (CIMA3) conference, scheduled for March 31st at the Student Union Theater and in the SU’s Room 104, across from Chuck & Auggie’s and the Blue Cow. 12:30 – Closing plenary remarks by Dr. Eban Goodstein, Director of Bard College’s Center of Environmental Policy and Sustainability MBA, best known as lead organizer of Power Shift, Focus the Nation, 350.org and other higher ed-focused climate action initiatives. Come and see for yourself what makes UConn a leader in Climate Adaptation! For more information about the event, please contact UConn’s Office of Environmental Policy at (860) 486-5773. Whether or not you believe the overwhelming scientific evidence about climate change and anthropogenic causation, you will probably agree that it makes sense to prepare for the worst of New England’s sometimes harsh weather. And regardless of whether you interpret the occurrence in Connecticut, over the past three years, of two 100-year storms, one 50-year storm, and a record-setting blizzard as a sign that the effects of global warming are upon us, or as random coincidence, you probably have done things recently to prepare for storms that you might not have done four years ago. Raise your hand if, faced with the more likely prospects of downed trees and power lines, you’ve done things like bought an emergency generator or chain saw for your home. Or if, with the forecast of more stormy weather and the risk of flooding or an extended power outage ahead, you’ve topped off the gas in your hybrid car or stocked up at the grocery store. If so, what you’re doing is a scaled-down form of adaptation, building personal and family resilience against the effects of what may be our “new normal” weather patterns. In planning for the more frequent and severe storms predicted by climate scientists, UConn was ahead of the curve two years ago when President Herbst reaffirmed the University’s commitment to a carbon-neutral campus and approved the addition of an Adaptation Section to our Climate Action Plan (CAP). 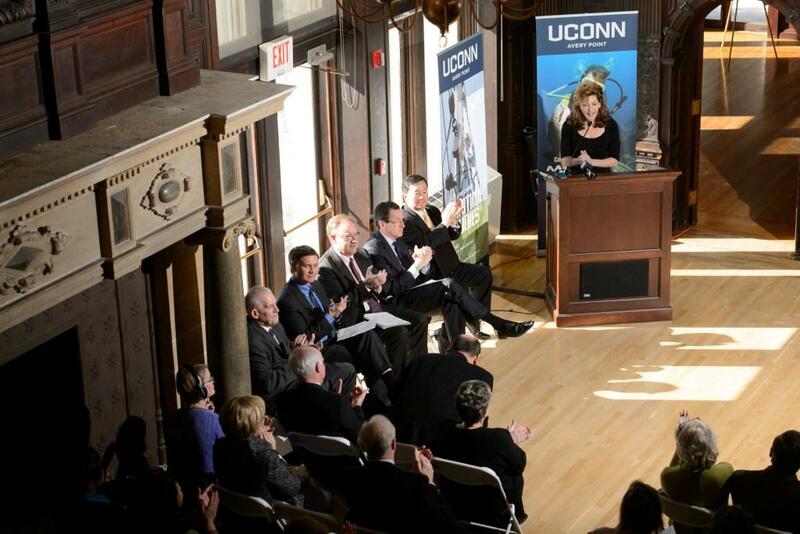 Since that late-March day in 2012, and in collaboration with the State of Connecticut, UConn’s progress on adaptation initiatives in particular has been remarkable. Sure, our CAP, like hundreds of others at college campuses across the country, contains a multitude of mitigation measures. By implementing many of them, UConn has successfully reduced its carbon footprint in existing buildings by more than 10% since 2010. But UConn’s 2012 Adaptation amendment, unique among colleges and universities at the time, offers to others our expertise and resources for adaptive response. Inherent in these recommended measures is the assumption that the world’s collective actions to reduce carbon emissions are too little, and possibly too late, to prevent damaging, or even catastrophic, consequences. 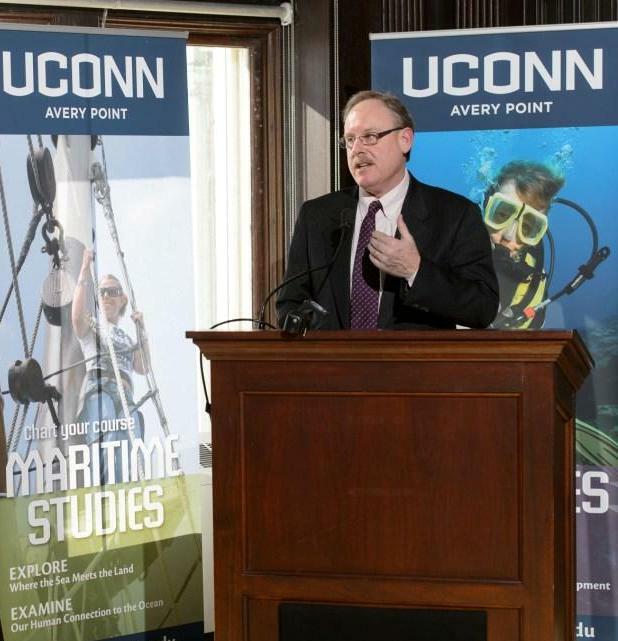 As Connecticut’s land and sea grant, public research university, UConn can and should play this pivotal role, especially in helping communities throughout the state and region protect property and natural resources, harden infrastructure, and ensure public health and safety. This two-part blog will review some of the activities that have made UConn a true leader in climate resiliency. An event in late-January marked an important milestone when local, state, federal and University officials, along with environmental advocates, gathered to announce the exciting news that UConn’s coastal Avery Point campus will be home to the new Institute for Community Resiliency and Climate Adaptation (ICRCA). The dedication of the new Institute was an event that would make anyone associated with UConn proud to call themselves an EcoHusky. It featured an impressive line-up of leaders and lawmakers taking turns at the podium, from Governor Malloy, to President Herbst, U.S. Senator Blumenthal, Congressman Courtney, EPA Region 1 Administrator Spalding and DEEP Commissioner Esty. As coastal communities face the more immediate risks of rising seas from global warming, the historic Branford House on our Avery Point Campus was an apropos setting for this ceremony, with Long Island Sound glistening as a backdrop through the windows of the crowded atrium. The Institute in Groton will unite faculty in the natural sciences, engineering, economics, political science, finance, and law disciplines, as well as expert staff from Connecticut’s DEEP and the National Oceanic & Atmospheric Administration (NOAA), in a front to increase both the resiliency and sustainability of the state’s communities, critical transportation and energy infrastructure, and coastline. It will receive an initial $2.5 million in operating funds from a joint EPA Region 1/DEEP settlement of an environmental enforcement action related to a Connecticut company’s wastewater discharges to Long Island Sound. Given this comprehensive list of public services, which track the goals of our CAP’s 2012 Adaptation amendment, there is no doubt the new Institute will be central to fulfilling UConn’s adaptation promises. For CTN’s public TV recording of the dedication ceremony, please click here. By Rich Miller, Director Office of Environmental Policy (OEP) and Kerrin Kinnear, OEP Intern (4th semester, ENVST). Frequently, when we think about environmental sustainability, our minds immediately turn to science. However, there are many parts of environmentalism that are not scientific (in the traditional sense). This blog post will give you a small background on some of those other elements that come into play. Clara Fang’s “The Art of Submission” stresses the importance of an aspect of environmentalism that is sometimes overlooked: the arts. In her essay, she explains the frequency with which people rely solely on science and technology to solve environmental issues, while the source of the problems, “our minds,” is overlooked. She calls attention to how we focus on altering the world around us to meet our needs, which oppresses the environment and other less fortunate people in the process, rather than changing ourselves to solve our problems. Fang shows how the arts, namely poetry, have the power to evoke emotions within ourselves that help us sympathize, realize the intrinsic value of all things beautiful, like nature, and motivate us to change our perspectives and take action towards solving our environmental problems. Read parts one and two of her thought-provoking essay on her blog. Aside from poetry, another form of the arts that has been used as a tool towards environmental action is photography. In the 1900s, one famous photographer, Ansel Adams, made a huge impact on the public’s opinion of the environment in the United States through capturing the natural beauty of untamed wilderness in his photographs and publicizing them through venues like the Sierra Club. Awe-struck Americans were motivated to protect the environment and advocate for national parks simply because of the sheer beauty of nature. This fall, UConn has a *new* interdisciplinary major between the College of Liberal Arts and Sciences (CLAS) and the College of Agriculture and Natural Resources (CANR) called “Environmental Studies” that emphasizes the importance of looking at sustainability from many lenses, not strictly focusing on the scientific or engineering fields. Arts, humanities, social sciences, natural sciences, engineering – every field can offer an important perspective on sustainability. While it was a little bizarre driving through such flat, open land, it’s because of this terrain that I had one of the most inspiring experiences of my trip. My family and I were driving along I40 through the northern stub of Texas when we came across an amazing scene: massive, white wind turbines lined the interstate, side-by-side for miles. I gazed at the turbines in complete awe. I’ve always been fascinated by alternative energy sources, and was excited to see machines harnessing wind power up-close and personal. This experience prompted me to research more about wind turbines and farms. To put the size of these turbines in perspective, the blades can be up to 150 feet long, giving them a rotor diameter the length of a football field! These giant structures are relatively cheap to build, quick to construct, and produce renewable energy through capturing kinetic energy in the wind and turning it into mechanical power. Because harnessing wind energy does not produce CO2, wind turbines also have the potential to reduce greenhouse gas emissions. 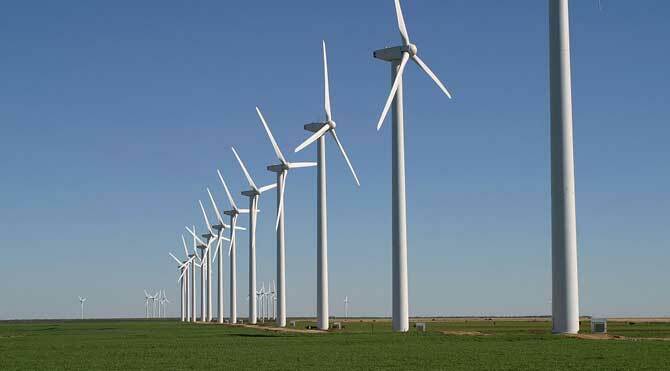 In addition, there are two types of wind turbines. Horizontal axis wind turbines (HAWT) are the most common and rotate horizontally, whereas vertical axis wind turbines (VAWT) rotate vertically. I was excited to learn that UConn has explored plans for small HAWTs at three sites on campus. Although right now, it looks like the installation of wind turbines is not cost effective for UConn (due to our highly efficient Co-Gen plant), it’s good to know it could be an option in the future! Next in our “Meet the Interns” series: Kerrin Kinnear! Kerrin is in her second year at UConn and found the OEP through a friend in EcoHusky! Her experiences with EcoHusky and environmental alternative spring break during her first year encouraged her to declare an Environmental Studies major. “This past year, I was involved in multiple environmental activities. In the fall, I became an active member of EcoHusky, where I learned about environmental initiatives on campus, volunteered for food waste studies, and pursued a leadership role in public outreach. My involvement in the club inspired me to take the Environmental Conservation class on campus, where I learned about the evolution of environmental policy over the last couple hundreds of years and the importance of protecting the environment. In addition, my experience with EcoHusky led me to an internship with Rising Green, an environmental start-up company that works to connect passionate students with green employers in the United States. “While these were all amazing experiences, the highlight of my freshman year had to be my alternative spring break. In March, I hopped on a bus with 52 other UConn students and headed down to Biloxi, Mississippi to help with environmental tasks in the area. We restored hurricane-damaged marshlands by transplanting 300 Cypress trees, as well as the endangered Sandhill Crane’s habitat by removing invasive vine and tree species. Seeing such beauty in the wildlife throughout the parks and forests we visited really motivated me to pursue a career in environmental policy and sustainability. “Next year at the OEP I will be involved in Composting and Food Waste, Sneaker Recycling, Earth Day Spring Fling, and EcoMadness. We’re excited to have Kerrin as part of our team! Look for her face at events this year!